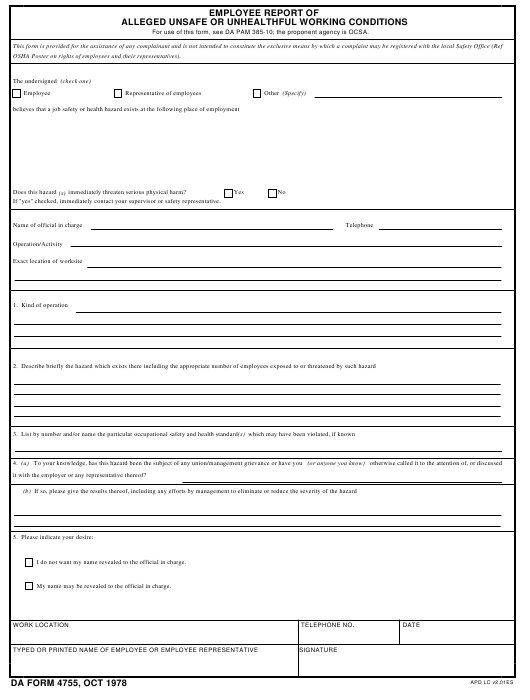 DA Form 4755 - also known as the "Employee Report Of Alleged Unsafe Or Unhealthful Working Conditions" - is a United States Military form issued by the Department of the Army. The form - often mistakenly referred to as the DD form 4755 - was last revised on October 1, 1978. Download an up-to-date fillable PDF version of the DA 4755 down below or look it up on the Army Publishing Directorate website. For use of this form, see DA PAM 385-10; the proponent agency is OCSA. OSHA Poster on rights of employees and their representatives). immediately threaten serious physical harm? If "yes" checked, immediately contact your supervisor or safety representative. it with the employer or any representative thereof? I do not want my name revealed to the official in charge. My name may be revealed to the official in charge.